Well done Debi! Great publicity. Love it!! Well done Debi! Sewing stardom!! Go you good thing, this is totally awesome! Congratulations! How wonderful is that! Oooh how cool is that! Congratulations. Well done, you deserve some public recognition for your amazing skills! Congratulations! You deserve all the accolades that can be given. how cool! the sunday mail is a big paper! just goes to show that sewing really is a "thing"! well done. Major two thumbs up, Debi!!! oh my gosh that is so fantastic and you look so great!!! oh wow, how exciting! I wish I had bought that paper now.... Good on you! How neat is that! I remember reading that publication when I was there...so exciting that you're in it! FANTASTIC!!! SO EXCITED FOR YOU!! Wonderful article, richly deserved. Am bummed I can't locate text online, to read article. That. Is. AWESOME. Congrats, girl!!!!! Thank you SO much for all your amazing comments! Makes super excited all over again!! What the WHAT?!?! Well we all knew you rocked, but now the rest of Scotland knows it too! Love ya! Congrats, you totally deserve this! Debi, that is so awesome! You are such an inspiration. That is awesome! They had a great idea and it is a fun read - I bet this is a popular piece! Wow, congratulations! Now, THAT is some news worth reading! YOWAZA debi! and that caption is killing me! can we get some close ups of the article for us out-of-towners?? Holy cow that is SO COOL!! And I love all the captions and the headline. How utterly fantastic, congrats!! I love the headline! Well done it looks amazing. Amazing!! I love this, you are awesome. And the captions -- the best! Congratulations!!! 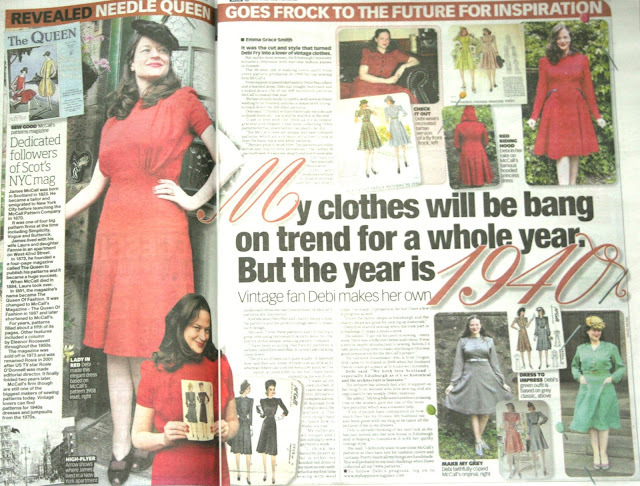 They couldn't have picked a more talented vintage seamstress to profile!! How cool is that?! Brilliant news Debi, congratulations! And very well deserved!